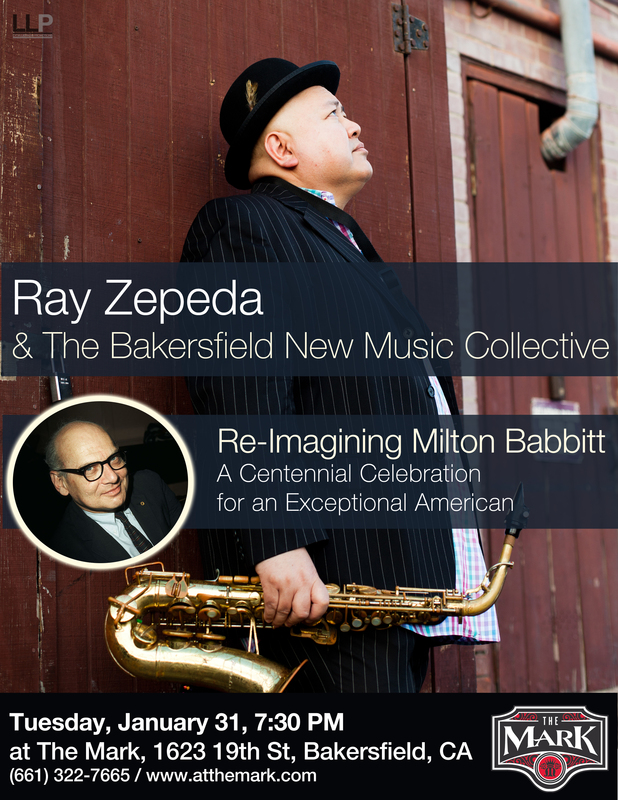 The Bakersfield Jazz Workshop, led by CEO, Steve Eisen is proud to present LA based saxophonist and flutist, Ray Zepeda alongside new-music advocates, The Bakersfield New Music Collective at The Mark Restaurant & Lounge, 1623, 19th Street, Bakersfield, California. Their performance, “Re-Imagining Milton Babbitt: A Centennial Celebration for an Exceptional American” takes place on Tuesday evening, January 31st at 7:30pm and admission is free. This lively night of music will feature a diverse range of original pieces by the Bakersfield New Music Collective and throughout the evening, the ensemble size will vary from solo DJ to jazz quartet or quintet to 11-piece ensemble. Performances on the night will be conducted by Dr. Doug Davis and Prof. Jim Scully. Founder and Artistic Director of the 16-piece, nascent Bakersfield New Music Collective, Ray Zepeda explains that “the mission of the Bakersfield New Music Collective is to present exceptional, uniquely American art that inculcates our values, celebrates our identity, inspires us, and enhances American life and, in so doing, work to form a society wherein such art may thrive”. A veteran of the Los Angeles jazz, reggae, punk, pop, and house DJ scene, composer/ saxophonist Zepeda has performed/recorded with Lou Rawls, Russ Ferrante (Yellowjackets), John Patitucci (Chick Corea), Joe La Barbera (Bill Evans Trio), Barbara Morrison, Thelma Jones, Carl Saunders (Stan Kenton/ Bill Holman), Dave Tull (Chuck Mangione/ Michael Buble), Lanny Morgan (Supersax/ Natalie Cole), Mike Bennett (Hillary Duff, Kenny G, JC Chasez), Darek Oles (Dianne Reeves, Brad Mehldau), Johnny Blas (CuBop Records), and DJs Mikie Smithers, Jim Carson, Serafin, and many others. Since beginning his professional career playing lead alto in various big bands at the age of 15, his musical palette has expanded to include everything from serious composition to avant-garde jazz to contemporary pop to punk rock. Mr. Zepeda holds the Master of Music in Jazz Studies from the University of Southern California where he studied with saxophonist, Bob Sheppard (Steely Dan, Chick Corea, Mike Stern), and the Bachelor of Science from Massachusetts Institute of Technology where he studied Composition with Pulitzer Prize and MacArthur Grant-winning composer, John Harbison. “I have long felt that there is this cauldron of creative energy in Bakersfield that has not had the voice or outlet it could have. The Collective could play a small part in an awakening that will allow local composers and performers to present new works to the local Community and try and build from there. This is only the maiden voyage”.